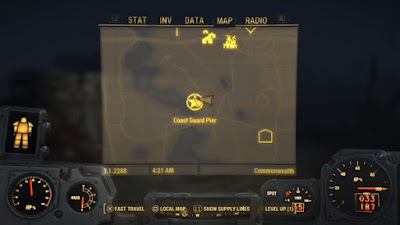 The Coast Guard Pier is located along the stretch of river that runs to the west of Diamond City, and is southwest of the City itself. You’ll know you’re getting close when you start to move out of the buildings and back towards sparser land. You may find the Pier through exploration, but Nick Valentine’s personal mission is more likely to bring you here. Blam blam blam! The simple one. Here ideally you want to pull the Super Mutants out and away from the main building and onto the street. The melee Mutants will happily oblige. Mind, however, that one of them will almost certainly linger in the watchtower at the back of the Coast Guard Pier, so you’re going to have to enter the grounds during combat eventually. Sneak! There aren’t a ton of Mutants and there’s plenty of cover, so this approach works fairly well. Just make sure the Suicider is your first target when possible - you don’t want him suddenly discovering you and then sprinting towards you. Snipe! 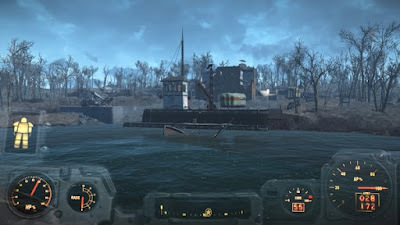 The Pier faces a hill to the east, and you can take out quite a few Super Mutants by slinking up here and shooting them from afar. Be ready to move when their Hounds come out to find you, however. Coast Guard Pier is not a well-lit location, so this approach will work better during the day. The rear of Coast Guard Pier in Fallout 4. It's so peaceful now that the Super Mutants are very dead. There’s a Nuka Cola Quantum (along with an assortment of other flavours) laying on the floor beside the machine near the entrance. There’s an Advanced locked safe behind the front desk. Sitting atop the safe is Eddie Winter Holotape 9. There’s an evidence lockup in the basement that’s kept sealed by an Expert terminal. Inside you’ll find a crapload of ammo boxes and chems, along with a Novice safe and an Expert safe. Also in the basement is a normal terminal. It can open a locked cell nearby that contains a copy of Astoundingly Awesome Tales. This terminal also provides the locations of Quincy Police Department and Natick Police Department for your map. On the second floor and roof, the roof in particular, you’ll find containers with ammo. You can also find a Mini Nuke on the roof, beneath a table. There are two small trailers beside the Pier, one of which is locked. There’s nothing great inside besides an Armor Workbench, but a gun trap will go off when you open the door. So, you know, be ready. There’s a crashed Vertibird to one side of the Pier. Hop inside the cockpit and you can find the USCG Holding Cell Key inside a footlocker. You can (I assume, anyway, since I’d already gotten in) use this to get inside the cell with all the goodies in the basement of the main building. Before you leave the area, take a look to the west, across the water. There’s a radio tower sticking up here. This is WRVR Broadcast Station, the home of Rex Goodman. Chatting to the NPCs in here (if you don’t already have it) will get you the quest Curtain Call. Have a quick look around the Station and you’ll find a copy of Live & Love sitting on a table, between a toaster and a coffee pot. If you speak to Anne in here you can recruit her as a Settler for one of your settlements, as well. That's probably the minigun that comes attached to every Vertibird. You won't be able to pick it up.